Al Wakrah (D1) strengthened their roster with addition of 27-year old American guard Jordan Downing (196-93kg-92, college: Presbyterian). He started the season at Atlas Ferzol in Lebanese LBL league. In two games he recorded very impressive stats: 15.5ppg and 1.5spg this season. Downing ended the last season at the Texas Legends in NBA where in 12 games he averaged 10.9ppg and 1.9rpg. But the most of that year he spent at the Knicks in NBA. In 19 games he had just 2.1ppg and 1.1rpg. In 2015 Downing was drafted by Bakersfield Jam (D-League) in fourth round (73rd overall). 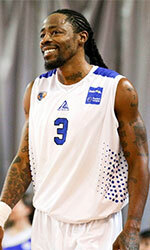 The former Presbyterian College standoutis in his fourth season in pro basketball. Among other achievements Downing won UBA championship title in 2015. He received also Usbasket.com All-UBA 2nd Team award back in 2015 at his college time. Downing has played also professionally in Luxembourg (Soleuvre), Sweden (Sundsvall) and Switzerland (Winterthur).